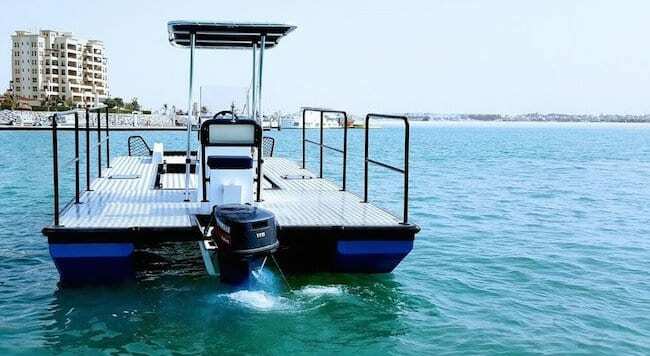 UAE-based Al Marakeb Boat Manufacturing Company has integrated its MAP Pro autopilot guidance system, into boats that have been designed to clear debris from water, to create autonomous cleaning USVs. Developed as part of an environmental initiative undertaken by the UAE government, the seven-meter catamarans feature interchangeable deck configurations allowing a variety of cleaning functions. The cleaning vessel is built with a hydraulic enabled wire-mesh basket which scoops debris from the water, and into a central holding bin that is removed and emptied upon route completion. Its dual hull structure provides stability while other notable features include its short draft allowing for effective handling and maneuverability in shallow waters. The catamarans voyage is controlled via the MAP Pro, an autonomous conversion device, and the route is designed with multiple way-points and speed configurations which are operated and monitored from an on-shore control station. Al Marakeb made waves in the maritime market, when it launched the first of its kind USV conversion device, MAP Pro, in 2016. The highly advanced system provides the ability to autonomously control any maritime vessel. The Director of Operations, Nour Al Sayyed said in a statement, “Driverless technology and unmanned vehicles have become today’s reality around the world. With the recent announcements of autonomous car initiatives in the UAE, the consumer market in the region is also adapting focus towards the development of technology in this field”. From cleaning boats to transportation and coastal surveillance, the USV manufacturer is currently taking on projects in the GCC, Europe and South East Asia.